Proudly I present you my fourth solo bass trombone CD. For this recording I have sought for the ultimate diversity in both musical styles and instrumentation. You will hear seven brand-new compositions for solo bass trombone, all written for me by some of the finest composers in music industry today! 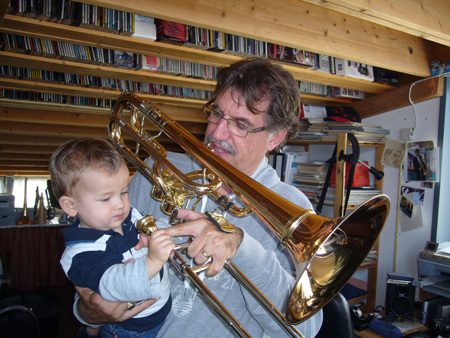 "Never Alone" will not only feature trombone-ensemble and flamenco guitar - like on my first CD "Nana" - but will also bring you compositions with brass band and string orchestra. I hope you will enjoy listening to this CD. Never Alone begins with a spectacular new composition by Steven Verhelst. "Intrada", scored for two tenor trombones, nine bass trombones and one contrabass trombone, utilizes multi-track recording technology. 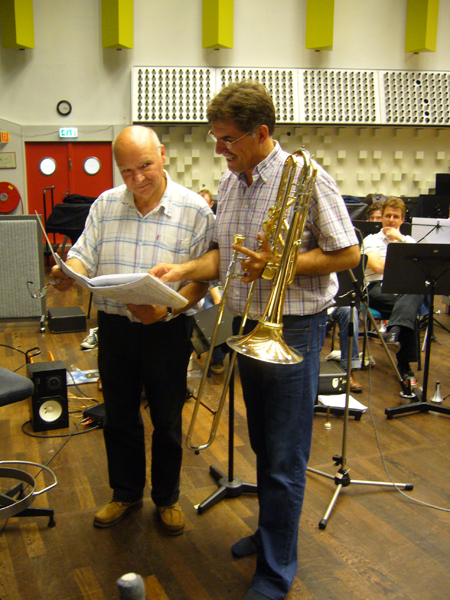 My friend, Martin van den Berg, a fabulous bass trombonist himself, and I, truly enjoyed ourselves during the process of recording "Intrada". 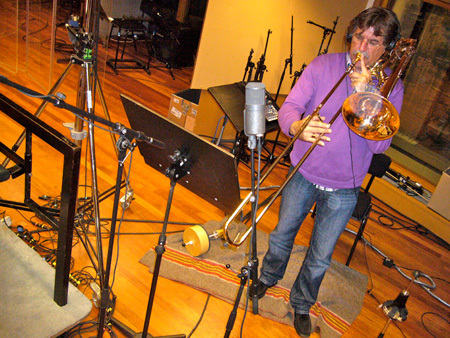 In this spectacular composition we both make use of "Tools4Winds" straight-, cup- and bucket mutes. 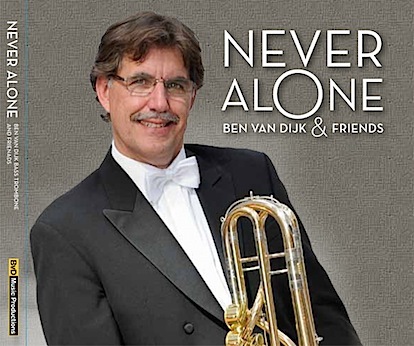 Composed by award winning Dutch composer and trombonist, Ilja Reijngoud, "Never Alone" showcases the wonderful ballade style of the bass trombone. Former students of the Rotterdam Conservatory "Codarts" make up the accompanying trombone quartet of this piece. These outstanding young players currently hold positions in major orchestras throughout Holland and Germany. The next composition again comes from the creative hand of Steven Verhelst. Scored for chamber string orchestra, "Concertino" features both the technical and melodic palette of the bass trombone. The world premiere, given by myself, took place during the 2007 "Arctic Trombone & Low brass Festival" in Norway. Spanish composer, Vicente Egea wrote a Flamenco-influenced composition on my request. "Rapsodia Flamenca", for bass trombone and trombone quartet. The Flamenco language used is the consequence of the admiration for this kind of music that the composer and also the soloist have. The work is written in a concert style and uses the different technical and expressive resources of all the members of the quartet in an ongoing dialogue that supports the soloist who plays a part of great virtuosity. The different composition elements of flamenco style like rhythm; harmony and melodic typical ornamentations, are the most used in this composition. At the same time the different themes used come back from the typical flamenco cantes or "palos" as buleria, solea, tiento and fandango that develop the musical discourse in a free shape of rhapsody. 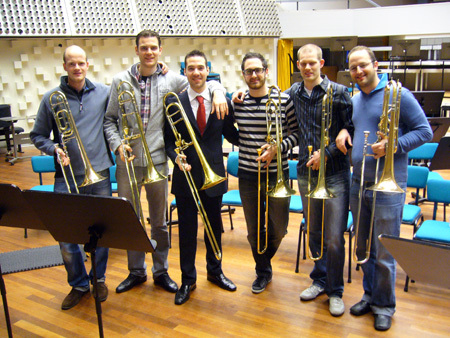 Steven Verhelst's spectacular "Capriccio" for solo bass trombone and trombone sextet, again features former students from the Rotterdam Conservatory. "Capriccio" was written especially for me and was premiered in November 2005 at the "Trombone Day" of the University of Kentucky. "My Spanish Heart" again features the compositional talents of Ilja Reijngoud. The piece is commissioned by myself for a performance at the 2006 International Trombone Festival in Birmingham, England. Ilja, in my opinion, has succeeded in his first composition for brass band. 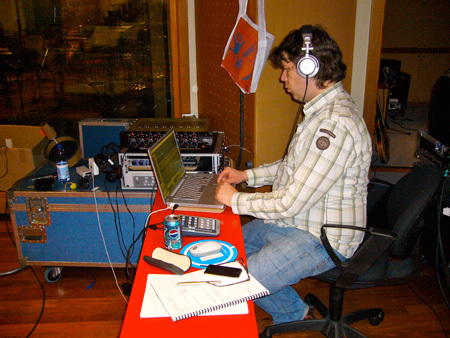 The demanding score highlights the special sound typical of Ilja's writing. The piece draws on both Spanish and jazz-influenced rhythm, harmony, and melody. The final piece, "Cancion para Cas", is composed by myself and has a special meaning. On July 12th 2009, my wife and I welcomed our first grandchild, Cas van Dijk. Whenever Cas stays with us, I always play him a little lullaby (Nana in Spanish) on my guitar before bedtime. Cas enjoys his Nana so much that I decided to arrange it into a new piece. "Cancion para Cas" also has additional special meaning to me because Cas's uncle, my youngest son, Erik, joins me on the other flamenco guitar part. This last composition of the CD also foreshadows my next recording project, a CD of flamenco and jazz-influenced music composed by Ilja Reijngoud and myself.